From the first company to bring organic cotton bedding to the United States comes a sleek alternative to the traditional terry robe. 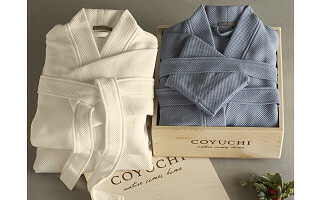 Like all Coyuchi cotton products, these unisex robes are made from 100% organic responsibly sourced materials without any toxic dyes, bleaches, or finishes. 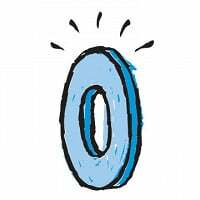 In fact, the company has earned GOTS certification (Global Organic Textile Standard) for its eco-friendly practices. Supersoft and comfortable like your favorite tee, only longer and more refined, the Jersey Robe features a kimono collar, patch pockets and a fit that's both relaxed and contemporary. Cozy and pill resistant, the Flannel Robe has a shawl collar, side-seam pockets, a self-tie, and double belt-loops for an adjustable fit. And then there’s the Pebble Terry Robe—a “terry” interior like no other. The Pebble brings spa-like sophistication to your home with a softly pebbled dobby weave. Slip into a Coyuchi robe and we think you’ll agree with our testers—do no harm has never felt better. I am Eileen, the CEO of Coyuchi. Welcome to the launch of Coyuchi on The Grommet, we are excited to be here with you today. Each of our products is designed to rejuvenate and inspire you and your home. The only thing we love more then organic cotton is hearing from our customers. I look forward to your questions! Are there any special instructions for laundering the flannel robe? @Marie Great Question! We recommend machine washing on the gentle or delicate cycle with cold water and a non-phosphate soap. Line dry, or tumble dry low and remove promptly. @Barbara Good question! There is quite a bit of crossover across the opening at the front. Depending on the size you order, there is from 7-10" overlap across the two front panels and should work nicely for both women and men. do they come in sizes? @rhoda Yes. The robes come in 4 sizes. As you click into the product page of each robe there is a size chart on the bottom right of the page that will help you determine the appropriate size robe to order depending on the size you wear in other clothing. @rhoda Yes! Depending on the robe style you choose, we offer sizes from Extra Small/Small to Large/Extra Large. On the page for each robe, once you have chosen a color it will give you the opportunity to choose size. You can then see all the sizes offered for each. Thanks for your question and enjoy! From the first company to bring organic cotton bedding to the United States comes a sleek alternative to the traditional terry robe. 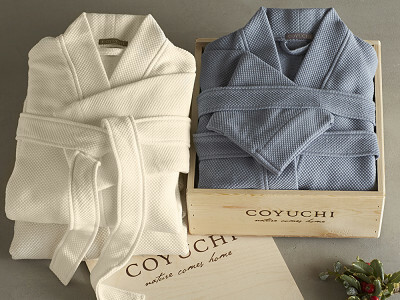 Like all Coyuchi cotton products, these unisex robes are made from 100% organic responsibly sourced materials without any toxic dyes, bleaches, or finishes. In fact, the company has earned GOTS certification (Global Organic Textile Standard) for its eco-friendly practices. Supersoft and comfortable like your favorite tee, only longer and more refined, the Jersey Robe features a kimono collar, patch pockets and a fit that's both relaxed and contemporary. Cozy and pill resistant, the Flannel Robe has a shawl collar, side-seam pockets, a self-tie, and double belt-loops for an adjustable fit. And then there’s the Pebble Terry Robe—a “terry” interior like no other. The Pebble brings spa-like sophistication to your home with a softly pebbled dobby weave.